Poseidon and his aquatic empire isn't my first choice when it comes to fantasy. In fact I tend to stay away from books whose premise involve mermaids, selkies, sirens, pirates, and everything naval because I simply cannot connect with them. It's weird because I have no problem indulging on these sort of stories onscreen (i.e. Pirates of the Caribbean, Odyssey, The Little Mermaid), so it's with great trepidation when I started Baba Yaga 2, WICKEDLY WONDERFUL by Deborah Blake. I loved the first one though so despite my hesitations I gave it a go. I'll be honest and say I didn't warm up to WICKEDLY WONDERFUL right away. The fish are scarce, merpeople and selkies are getting sick and The Queen of the Otherworld employed Baba Yaga, Beka Yancy, to investigate and figure out WTBH is going on with the sea people. The mystery didn't take long to solve because the villain and his motives were revealed soon enough so there's not much guesswork there, the hook lied on how long can he deceive Beka and play her insecurities against her and what kind of Hell she's going to give him once she figures it all out. So the plot isn't really my thing and that's a subjective assessment because of the above mentioned dysfunction. Instead it's the human element part that intrigued me and kept me reading. 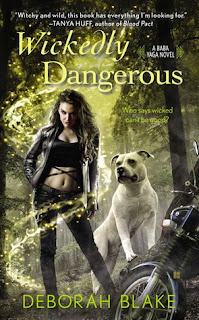 I thought WICKEDLY WONDERFUL will be a redo of Wickedly Dangerous, badass heroine and impossible human and naive hero with an environmental issue to tackle. Well it's still sort of that with a little tweak on Beka's character. I was pleasantly surprised of the twist DBlake used here, instead of a seasoned Baba Yaga, Beka, is new to the position and very insecure about herself and ability to perform her duties well. The moral conflict revolved around that uncertainty on her part and it helped make Beka's character development better than Barbara's. The hero, Marcus, was more or less similar to the previous one, he's okay but I didn't swoon over the guy. A little rundown: Marcus is an ex-Marine who's not really suave with the ladies, he has a big heart but comes across as grumpy and prejudiced against Beka whom he thought was a "tree-hugging hippie". I did like his hate/love relationship with Beka though and I found his blunders amusing. Yeah, lots of foot-in-mouth moments here. My only critic lies on how underutilized DBLake's dragons are. Baba Yaga's dogs, or Chudo-Yudo, are actual dragons but they don't play a big role in the story despite sharing the covers with the heroines. Aside from the main dragon there are the Riders, also dragons, but they take on human form and are the Baba's reconnaissance group. I said these before and I'll say it again until I get my wish, these Riders need a spin-off series because they are hot chunks of sexiness and I want to know more about them. 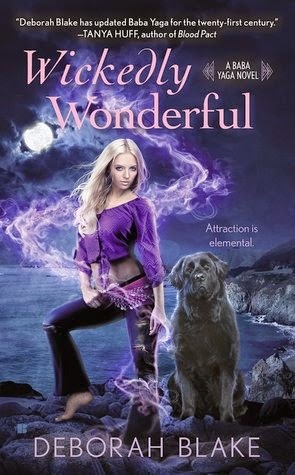 WICKEDLY WONDERFUL is a PNR-HEA novel and compared to Wickedly Dangerous, the ending is waaay better, it wasn't rushed and tied with a neat and cute little bow like the first book. Another thing that works here is I believe you can get away with reading this as stand-alone as there's no series arc and Beka's story is very independent from the first one. So there's no reason for you not to check this out! Someone recently asked me to write a short story about how Beka Yancy, the Baba Yaga from my book Wickedly Wonderful, would go Christmas shopping. There was only one problem: Beka is a witch, from a long line of Russian witches, and therefore Pagans. In short, neither she nor the other Baba Yagas (like Barbara Yager from Wickedly Dangerous) would celebrate Christmas—they would celebrate the Winter Solstice. It turned out okay, since I had a fun time writing a short short about Beka doing her Solstice shopping for her sister Babas, but in the process, it came to my attention that lots of people don’t know much about non-Christian holiday celebrations at this time of year, other than to agree that no one knows how to spell Hannukah. Er, Chanukah. I mean, Channukah. Nevermind. I grew up Jewish, and I still don’t know how to spell it. A little trickier to spell is Kolyada, the Russian Winter Solstice (and don’t even ask me to pronounce it—I may have Russian Jews as ancestors, but they’re not around to translate, and I refuse to hold a séance just to find out how to say Winter Solstice). Beka and her fellow Babas might well observe the holiday of Koliada (I told you it was tricky), which traditionally took place on the night of the Solstice. Bonfires and candles were lit on this, the longest night of the year, to encourage the return of the light. People went from house to house, singing traditional songs and collecting sweets along the way, a slight variation from the English traditions, where folks were usually given something alcoholic to drink at each neighbor’s house, which led to rather a rowdy holiday, as you might imagine. 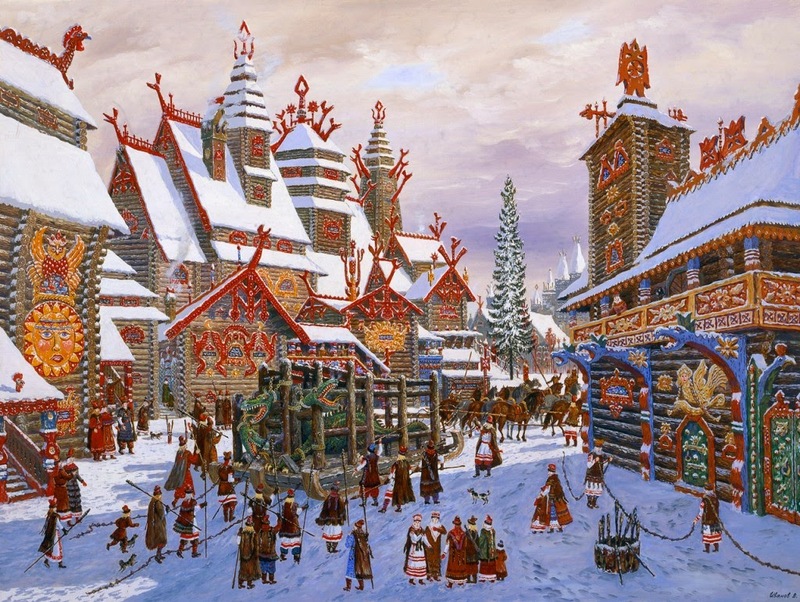 Like the Pagans on the British Isles, the Russians had a version of an old man bringing gifts (in this case, he was called Polaznik, although in other lands he was sometimes known as Father Frost, or some other name). I’m not sure what kind of gifts Polaznik would bring to Beka and Barbara—maybe a new surfboard for Beka, and a nice pointy sword for Barbara. And, no doubt, a VERY large and meaty bone for each of their dragons-disguised as dogs, the Baba’s companion Chudo-Yudos. Of course, Beka and her sister Babas are modern women (even if they were raised by powerful witches out of ancient Russian fairy tales), so they would probably mix a bit of the new with the old. My guess is that they would gather around a bonfire, decorate a living pine tree with magical lights and trinkets from their far-flung travels, and probably feast on roasted chestnuts (and a few s’mores for Beka’s dragon-dog Chewie, who is particularly partial to such things). And then they would raise a glass of mulled wine to the returning of the light and to being in the company of those that they love—because no matter what your origins, that’s really what the holiday is all about. One is a finished copy via the publisher and one is my ARC. I am glad you gave this a try and liked it. Mermaids and the like aren't ever my first choice for books either and I seldom like them but like you, I have no problem whatsoever watching them on the big screen. You and I are so similar! I know you're iffy about sci--fi too, we can so totally be in the same book club! I'm glad you had a great time with the book even if it was difficult at first to het into the book. I have book 1 because I bought it as soon as I heard about the book but I haven't read it yet. I should! Too many books lol it's terrible ! thanks for the review and the post. I don't know how I feel about stories set in the sea but I think I'd love the mythology in this series. I really enjoyed the guest post as well...all that holiday history is interesting. :) Happy Friday, Braine!! I hope you've had a great week! Right?! I know Christmas is really an amalgam of pagan celebrations but it's still great to know which part came from where, you know. LOL I just finished this one yesterday and my first thing was a post to the author/penguin that I needed a dragon-dog and books on the Riders. I LOVE them. I wish there was more of them in the books. Right?! They need to have more face time! I hope you get to read at least the first one before the year ends! I don't know why they do that instead of releasing the next one a year after. Any ideas? I don't read many mermaid books either although I do want to start trying more. The cover is really pretty though. Great review! This series is on my wishlist and I am glad you eventually got into this..I think I will enjoy these. Are they on audio? I so totally need to pick up the first book! Now me, I am all about the various supernatural creatures in my books. This sounds pretty awesome. Dragons!!! !